Sharing my 3-month old experiment with blogging, has prompted questions like: What's a blog? Why would you blog? And how does one blog anyway? It often features reader interactivity e.g. polls or comments. There's a hierarchy of platforms out there on which to publish your blog. There are ones with very low barriers to entry (e.g. micro-blogging on Twitter), all the way up to platforms you run on hosting services of your choosing that are so extensible they can power enterprise CMS systems (e.g. WordPress). One of the easier ways to start is by micro-blogging using Twitter.com. It's much easier to compose 140 characters than to write a blog posting of several hundred or even several thousand words. You can also easily augment your tweets with photos using services like TwitPic.com. 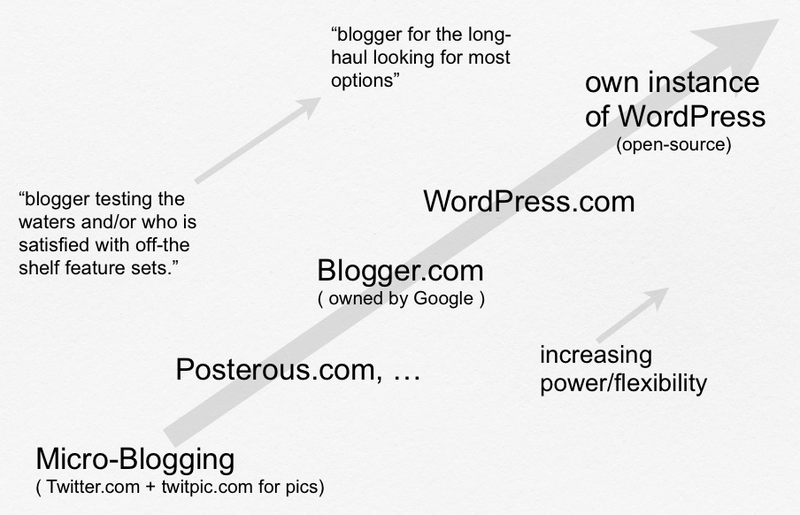 Newer blogging hosts like Posterous.com offer a simple way to start blogging. At the higher-end, hosted blogging services like WordPress.com offer more features. For maximum flexibility WordPress.org provides open source code that can be installed on your Apache/MySQL/PHP web-hosting service of choice, and then enhanced to your heart's content. I recently set up an email address based on Google's gmail but using my own domain. Blogger.com, being also owned by Google, provided the path of least resistance to share this domain for hosting my blog. Ultimately I imagine I'll set up my own instance of WordPress on a web hosting service for even more flexibility. But for now I look forward to Google's plans for Blogger.com in 2011.